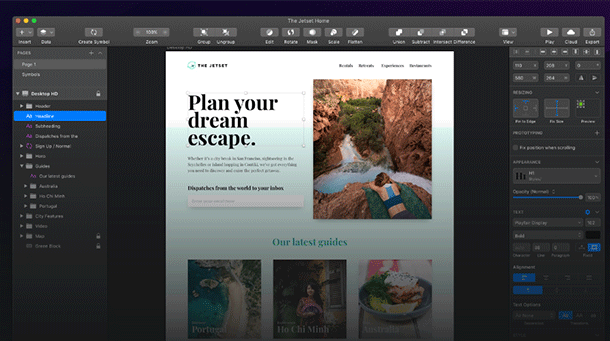 Is Sketch the Answer for Web Designers? The utilization of sketch for designing dynamic websites has grown leaps and bounds. Furthermore, the sketch to HTML conversion services also makes for a good addition to a web designers toolbox. Sketch, being a perfect designer application that wholeheartedly supports MAC, is also considered an incredible platform that can be exploited for the purpose of web development due to its splendid ease of utilization as compared to its counterparts. And there is more in the offing. The productive features in Sketch, assist in carving splendid web designs that were once considered a tough nut to crack for web designers. No matter how mesmerizing Sketch appears, it certainly has got some shortcomings as well. Read on to discover its pros and cons. Pristine-Pixel Designs:One tremendous trait of Sketch that positions it in a different league altogether is its pixel-perfection. Sketch redefines the object without compromising on the quality of the object even if it needs to be subjected to altering sizes. Additionally, even when the users are utilizing vector objects, it is remarkably simple to redefine the designs according to the need of the hour. Pristine-pixel designs serve the purpose brilliantly when viewed in various browsers. Exceptional Integrated Grids:Sketch has got the back of developers as it offers ample keyboard shortcuts to them. “Smart guides” clears the picture perfectly. The option can be used convincingly by grabbing an object and then allowing ALT to view all the information regarding the objects. The Artboard Advantage:Sketch has been blessed with a countless canvas. This fantastic feature allows users and developers to operate Artboard presets but also allows the users a wide variety of alternatives to opt for presets from the sub-toolbar when they click on it. Presets permit the work management by classifying the dimensions beforehand. The variety of designs is vast to select according to the need. Terrific Templates:As an impressive application, Sketch has the ability to craft new files straight from the templates only. The job is quite effortless via the menu item file > new from the template; nevertheless, use can also secure existing files as templates to kick-off projects from the start. For achieving the same, go to file > save as templates. Not an Ideal Substitute:Sketch, labeled as a web design tool initially, is not up to the mark when it comes to photo editing. When judged against Photoshop, Sketch falters unusually in the long run. The not so good news about Sketch is that users can indulge in designing only at 72 dpi. Getting Accustomed to New Programs:Understanding new features in Sketch is no walk in the park as users often need to scratch their heads. It is time-consuming as users need to generate an advanced workflow to get going. Nonetheless, it is not completely out of the box and accomplishing few projects can help the users get accustomed to the new features. The Colour Conundrum:Photoshop allows users to locate colors as their preference, which is not the case in Sketch. However, the advantages outweigh the disadvantages when traits of Sketch with related tools are evaluated for web designing reasons. Furthermore, assessing Sketch to HTML conversion helps to save a lot of web development time. Undoubtedly, there are other extraordinary features in other applications that certain users may not approve of when judged against the features that Sketch has to offer. However, this application is outstanding as it has turned web development into a simple process for the developers and the users as well.